Sennheiser doesn’t really need a lengthy introduction. It is a legend in the audio world and lots of consumers simply choose Sennheiser by brand alone because they know they can expect the company’s products to feature fantastic audio quality. However, there is no denying the increased competition as of late and it is coming from multiple fronts. Audio companies are also fighting for the living room and Sennheiser wants to get into the action as well. In early 2015, Sennheiser announced four new headphones reviving a series in the process. One of the headphones in this series is the Sennheiser RS175. The Sennheiser RS175 is a pair of wireless headphones that might look like the typical headphones you would want to connect to your smartphone but it is primarily focused on being a part of your home theater system. The design of the transmitter really shows as it looks to blend in with other home theater components. It is a tower-like design with a stable base and unlike the cheaper RS165, it has both a 3.5mm jack and optical jack along with matching cables so it is really meant to be hooked up to a TV. Once connected, the transmitter can transmit sound to the Sennheiser RS175 headphones over a proprietary 2.4 GHz wireless link. If you buy the Sennheiser HDR 175 headphones, the transmitter can broadcast audio to both the RS175 and the HDR175 allowing two people to enjoy the private audio experience. The transmitter has a unique trick as it serves as the charging station for the headphones as well. You don’t even have to take the pair of rechargeable AAA batteries out of the RS175 either. Below the headband lies some contacts that you have to align with the contacts found on the top of the transmitter. Resting the headphones on the tower actually looks pretty cool and there is a nifty charging indicator to tell you if the contacts are aligned properly. The Sennheiser RS175 doesn’t offer the premium comfort experience that their expensive wired products offer but the earpads are thick enough to provide just enough comfort to last through a couple of movies. The headband padding is a bit odd as it consists of two separate paddings to make sure the charging contacts are exposed. You might feel some slight discomfort on your head as a result if you keep them on for too long. The audio output is very good considering the RS175 is wireless. It is noticeably better than any pair of Bluetooth headphones and there are some useful modes to augment the sound even further. The first is the bass mode which can cause certain tracks to distort at high volumes but really drives up the low-end to appreciable levels. Then there is the surround sound mode which is lacking in the RS165 and improves the movie experience. The most important difference between the Sennheiser RS175 and the RS165 is the wireless range. At a direct line of sight to the receiver, the headphones can operate up to 100 meters away. Walls will obviously reduce the range but when testing in multiple spots of a standard house, the audio never dropped out or stuttered. • Great design execution for the transmitter. • Good audio quality for both music and movies. • Rechargeable batteries right out of the box. • Padding on the headband can cause pressure on the head. 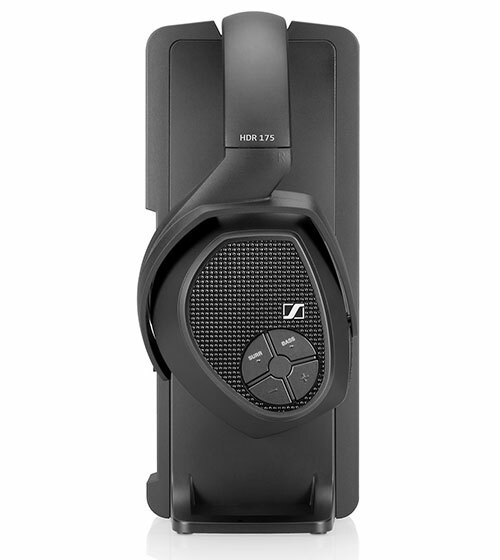 For roughly $280, the Sennheiser RS175 is really not a bad deal. In fact, the Sennheiser RS175 is quite versatile as a consumer headphones and it doesn’t compromise on audio quality just because it is wireless. Only purists will disagree.